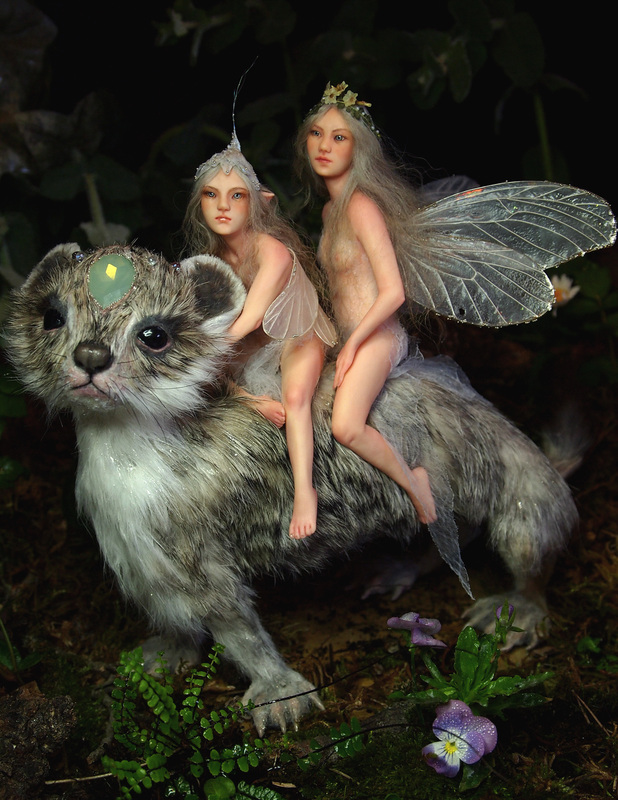 I'm a 35 year old self-taught artist living in Barcelona (Spain) and I create One-of-a-kind faerie sculptures under the name of Nenúfar Blanco. The meaning of Nenúfar Blanco in english is White WaterLily. Water lilies has always been one of my favourite flowers, which I have always related to nymphs, fairies and other nature spirits. I love water lilies because they are eerie plants that are deeply rooted in cold and stagnant waters, growing in shady locations with adverse living conditions but even so, its flowers are beautiful, bright and they convey serenity and pureness... just as my sculptures, they all are delicate and melancholic creatures with strong hidden passions beneath the apparent calm. I started sculpting in 2005 but since I can remember I have always been very creative, as a child I loved to create illustrated diaries, write short poems, make paper dolls, etc... Handling and playing with modelling clay always brought me a feeling of calm and inner satisfaction, it was like meditating at a very early age! My main medium is polymer clay, I also use recycled vintage fabrics and small treasures that I collect in the woods and seashore. I love working with lichens, shells, small roots, dried flowers, etc ... This is always one of my favorite parts! My goal is to make little creatures as realistic as possible, so I'm constantly thinking of new techniques and searching for new materials to achieve the effect I want for them. The scale of my dolls is quite small, they measure from 4" to 7" approximately. I also make miniature fairy babies and larger busts. My work is mainly inspired by Faerie Realm and Nature for which I feel a beautiful attraction, but other of my influences is the aesthetics of the Pre-Raphaelite painters. Movies,literature, music, walking through the woods and daydreaming too much is also a big source of inspiration. Doll-making is my passion, this art form offers me creativity with endless options to explore and I am very happy about it, I hope to continue improving in my sculpting and encourage others to try through my tutorials."